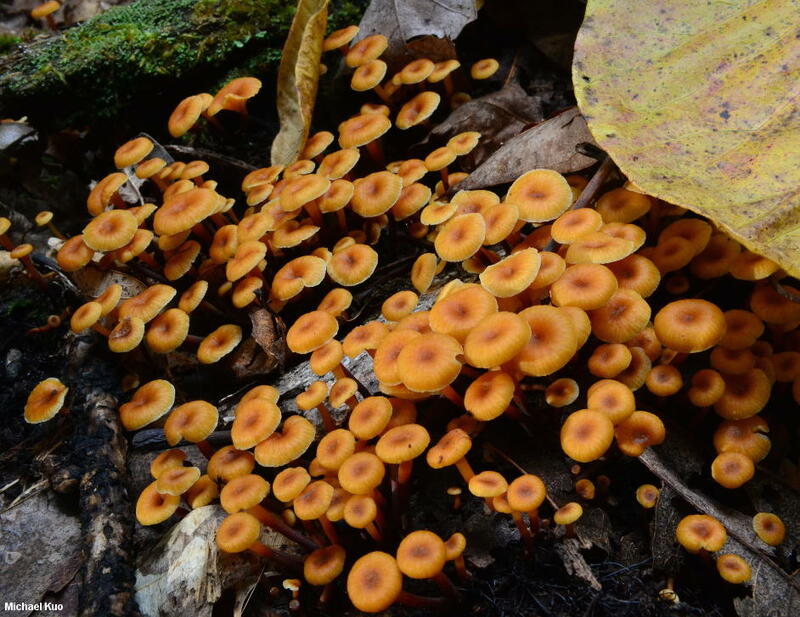 This tiny mushroom often fruits in stunning numbers on stumps and dead logs in hardwood forests. It has a white spore print, gills that run down the stem, and a wiry stem that is yellow above, and brownish below. 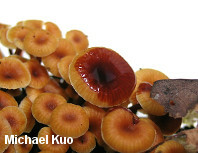 On close inspection, the gills are often connected by many cross-veins—one of the defining features of the genus Xeromphalina. 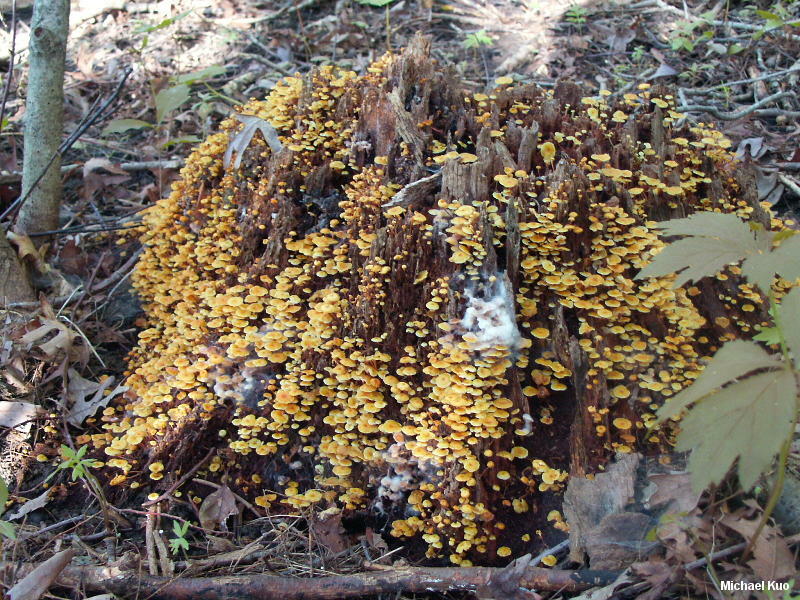 The very similar Xeromphalina campanella appears on the wood of conifers and has slightly wider spores. 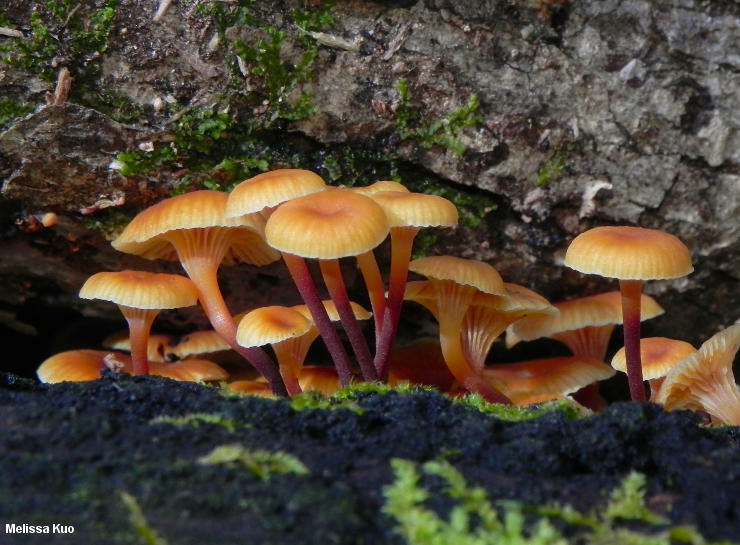 Ecology: Saprobic on the deadwood of hardwoods; growing in dense clusters (sometimes by the hundreds!) on stumps and logs, or occasionally growing in small clusters or even alone; spring through fall; widely distributed east of the Rocky Mountains. The illustrated and described collections are from Illinois, Arkansas, Michigan, and Québec. Cap: 0.5–2 cm across; convex to broadly convex or flat overall, developing a deep central depression; bald; becoming lined or pleated, especially toward the margin; brownish yellow to brownish orange or orangish brown; paler towards the margin; fading. 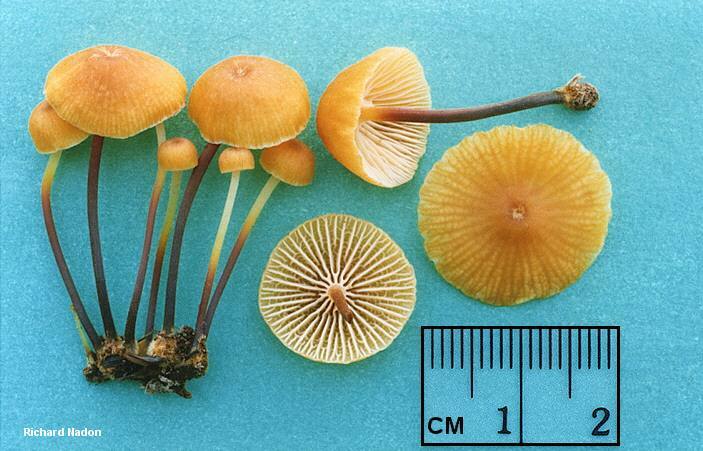 Gills: Running down the stem; close or nearly distant; with many cross-veins; pale yellow; short-gills frequent. 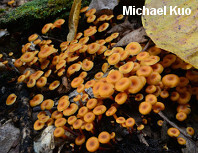 Stem: 1–2.5 cm long; 1–2 mm thick; more or less equal, or tapered to the base; rusty yellow above, darker brown below; bald, or sometimes with orange basal mycelium; wiry. Chemical Reactions: KOH bright red on cap surface. 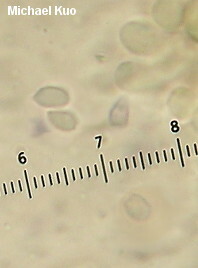 Microscopic Features: Spores 3–6 x 2–3 µm; ellipsoid; smooth; weakly to moderately amyloid. Pleuro- and cheilocystidia fusiform to narrowly clavate; up to about 30 x 10 µm. 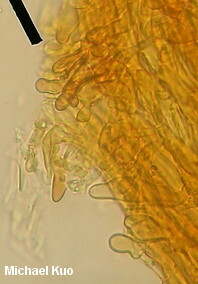 Caulocystidia clavate to fusiform; thin-walled. Pileipellis a cutis; elements 3–15 µm wide, encrusted, orangish, clamped at septa. REFERENCES: A. H. Smith, 1953. (Miller, 1968; Smith, Smith & Weber, 1979; Arora, 1986; Bessette, Miller, Bessette & Miller, 1995; Halling & Mueller, 2005; McNeil, 2006.) Herb. Kuo 05169507, 05299502, 08270204, 10251307.